This fresh meal idea combines the sweet flavours of winter’s apples and parsnips with the zest of wild garlic. The parnip is first roasted and then blended into a rich soup with apple, rosemary, and a splash of cream. 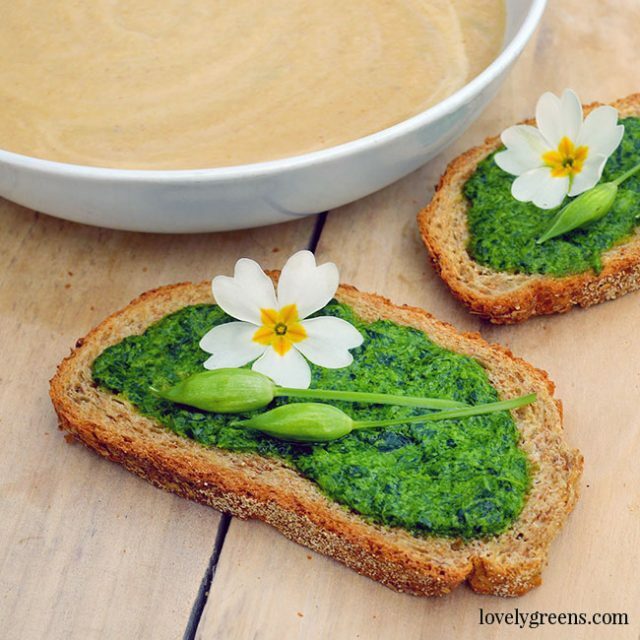 A handful of wild garlic is then pureed with olive oil and sea salt and then spread over slices of fresh bread. 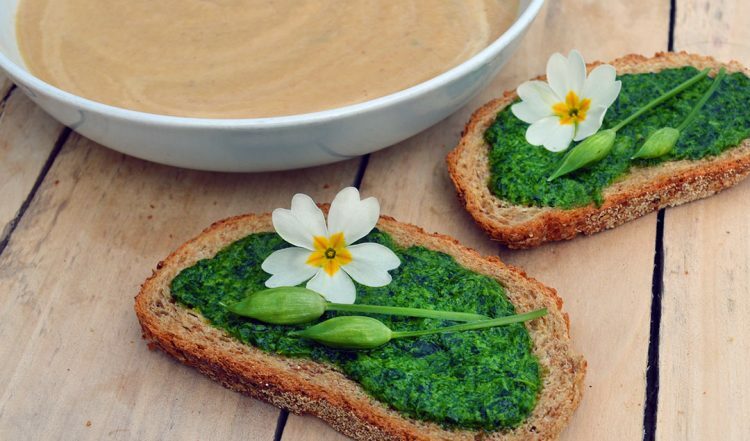 A few edible flowers are perfect for decorating this spring time feast. 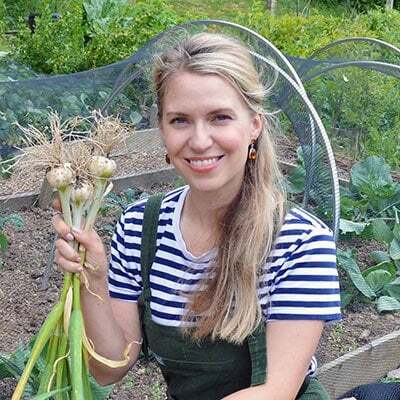 I’ve seen Wild Garlic for sale at Borough Market in London and am sure that you can find it at similar farmers markets across the country. 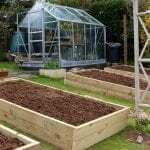 The leaves wilt quickly though so I imagine that’s why the price you’ll pay for it is usually quite dear. Fortunately, foraging for it is easy and if you live in an area where it grows, it makes sense to pick it wild. 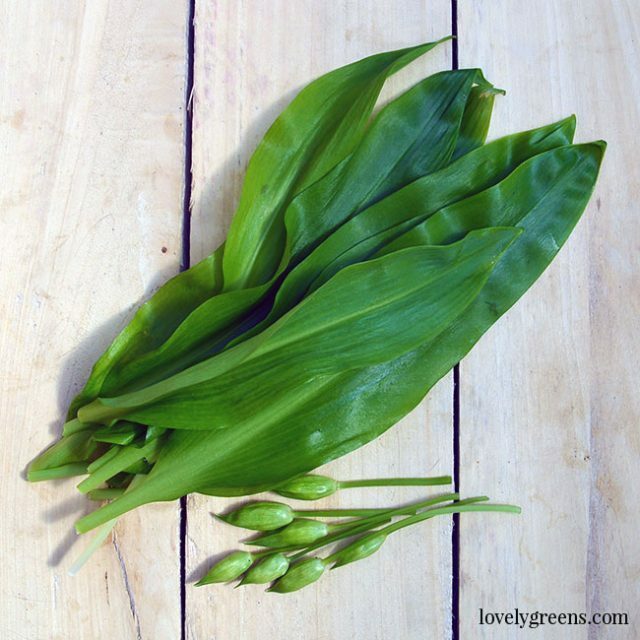 Also known as Ramsons, Ramps, Bear Leek, and Bear Garlic, Allium ursium is native to Europe and Britain and grows in moist and temperate areas. It likes the same habitat as wild bluebells and so you’ll often find it growing in hedges and along streams. 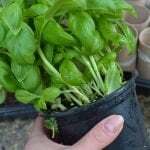 Both its leaves and bulbs taste of garlic, though not as strong as the bulb garlic most are more familiar with. 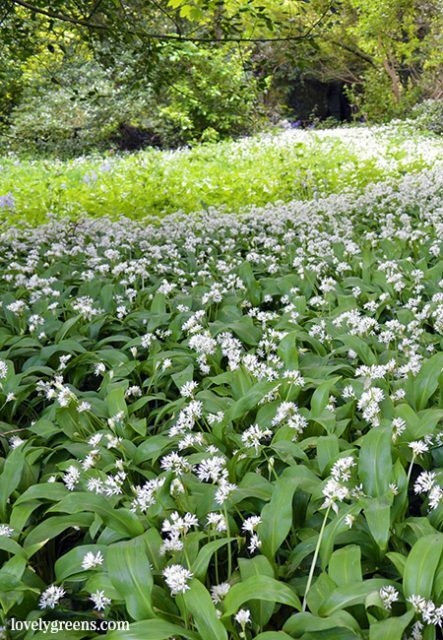 Wild garlic can only be confused with a few other plants including Lily of the Valley, Veratrum viride, and Colchicum autumnale. The difference is that wild garlic smells intensely of garlic. If what you’ve found doesn’t — don’t eat it. The others mentioned above are toxic. If in doubt, wait until the plants begin blooming like in the photo below. The white flowers are an umbel type and appear in late April and May. If you live in an area where wild garlic grows you’ll know it. Just driving by a patch is enough to fill your car with its not-so-subtle scent. April is peak season for it, and it’s a wild green that is extremely easy to identify and forage. Foraging laws allow you to legally harvest the wild leaves from public land in the Isle of Man and United Kingdom. 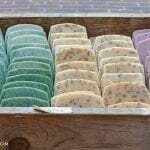 For more info on UK foraging laws, read this article. Local byelaws may be different so please research before you pick. Make sure to forage well away from roads and paths to avoid vehicle pollution and areas where dogs may have been past. The wild garlic you’ll find growing in the eastern United States and Canada is similar but different to the wild garlic across the pond. Allium tricoccum is also called wild garlic or Ramps and can be used in the same way as the European. Foraging laws in North America will vary from region to region. Get in touch with a local foraging group or governmental authority to find out the particulars. Please also be aware that Ramps are considered endangered or ‘of special concern’ in some areas including Quebec, Maine, Rhode Island, and Tennessee. You can use this recipe to spread on bread or you can toss it with pasta. Basically use it as you would any other pesto. To make, shred the wild garlic and spinach into a bowl and then pour the olive oil and optional cream over it. Blend with a stick (immersion) blender (or food processor) until puréed. Stir in sea salt and serve immediately. 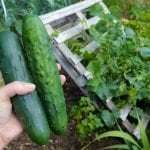 Can be refrigerated for up to two weeks. It can also be frozen or bottled (canned). 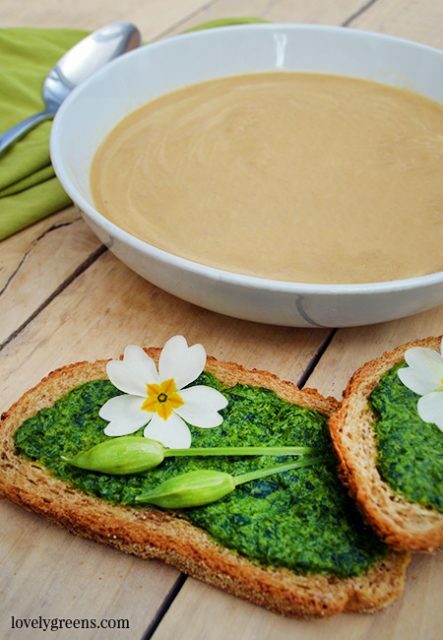 For this recipe, spread the pesto on fresh slices of crusty bread and decorate with edible flowers. 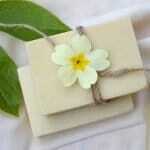 I’ve used white primroses and the unopened buds of wild garlic flowers. The last of your winter parsnips are fabulous used in spring soups. Blended with an eating apple, onion, and rosemary, this soup is thick and creamy and an absolute joy to eat with crusty bread. 1. 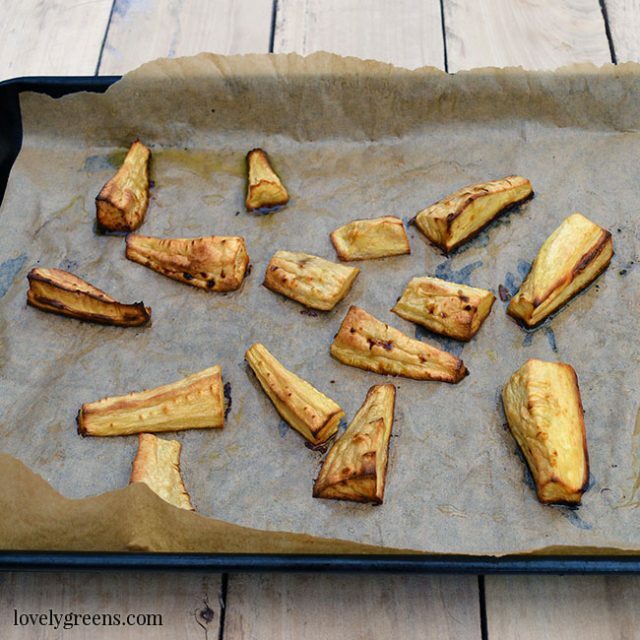 Toss the chopped parsnips with olive oil and roast them in the oven for thirty minutes or until golden on the edges. 2. Saute the onions and chopped apple in a teaspoon of olive oil on the hob. When the onions are translucent, sprinkle in the paprika and sea salt and then stir well. 3. Strip the leaves off the rosemary stalk and add them to the pan along with the roasted parsnips and water. Bring to boil and then reduce to a simmer. 4. Simmer for about ten minutes and then take the pan off the heat to cool slightly. 5. 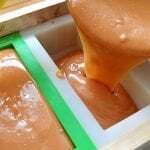 Purée with a stick (immersion) blender or in a food processor. 6. Stir in the cream, reserving a little to decorate the top if you wish. Serve immediately.